Salt Lake City’s Greenbike bike share program will go in to hibernation from December 15, 2013 until Spring 2-14. Ridership diminishes in the winter months, and so to save wear and tear on the bikes and stations, the system is shut down for the winter. The system has been wildly successful as a transportation alternative in the downtown area. Over 26000 trips were taken in the first year among 6100 users. The system opened in April 2013. The 52000 miles ridden saved approximately 2114 gallons of gas and 50977 lbs of CO2 emitted. Greenbike is a non-profit bike sharing system. Individuals buy a daily, weekly, or yearly membership for $5, $15, or $75 respectively. Bikes are then free for the first 30 minutes of use with a membership. 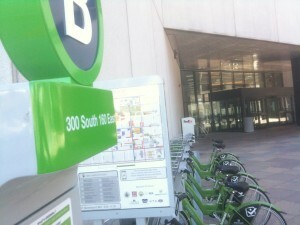 Currently, 12 stations and 75 bikes dot the downtown Salt Lake City landscape. 7 new stations will be added, and existing stations will expand by 30% to accommodate increasing demand.